Pilates is a precise series of exercises that help develop strength, flexibility and posture, without building bulk or stressing joints. A good complement to cardiovascular exercise, athletic training or rehabilitation, Pilates exercises help you tone your body, feel revitalised and move with ease – if done regularly and with an understanding of what suits your own body in particular. Pilates is excellent for all ages, fitness levels and goals. Pilates can be done either on a mat on the floor OR using larger pilates equipment, such as a reformer or tower. Pilates was originally intended to be taught in a studio environment with specific Pilates equipment offering a higher degree of precision, support and challenge than is possible in a group mat class. As awareness of the value of Pilates movement has increased, group mat classes have become popular as they do not require specialist equipment. Doing pilates on the mat, you are essentially using your body weight for resistance against gravity. However, you must always be sure that your instructor has comprehensive pilates training and you are being taught the movement as it was intended. 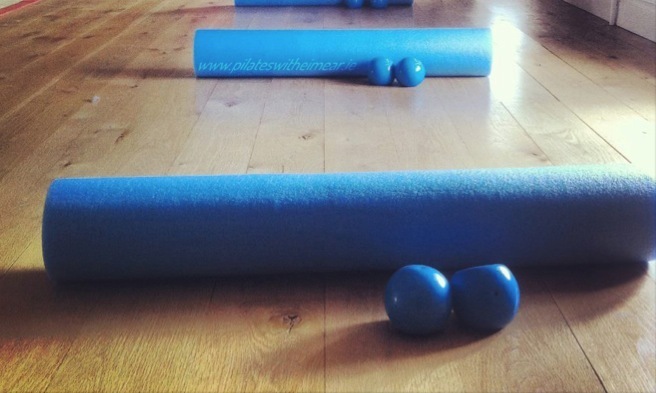 In my group mat classes, I use small portable pieces of equipment, such as stability balls, weighted balls, flexbands, magic circle and foam rollers. This makes pilates more accessible, more fun and sometimes more challenging! The larger pieces of studio equipment – for example, reformers, cadillacs or arc barrels – arguably give a truer pilates experience! They allow people who may not be able to work on the floor to benefit from pilates and ultimately make pilates more rewarding for all. In my small home studio, I have a Rehab reformer, tower, arc barrel and ballet barre. I bring my knowledge and experiences from my home studio to my mat teaching. What exactly is STOTT PILATES? All Pilates practice is based on the original principles set out by Joseph Pilates. STOTT PILATES is just one contemporary approach to the original exercise method pioneered by the late Joseph Pilates. In some respects Pilates is like Yoga. Both emphasise deep breathing and smooth, long movements that encourage the mind-body connection. The difference is that, while Yoga often involves moving from one static posture to the next, Pilates flows through a series of movements that are more dynamic, systematic and anatomically-based. The goal with Pilates exercise is to strengthen the postural muscles while achieving optimal functional fitness. Some people say Pilates is like Yoga without the spiritual dimension, i.e. more emphasis on the purely physical. I am also a Yoga enthusiast and often blend the best of both Yoga and Pilates into a gentle sequence of stretching, breathing and relaxation to give you a workout that leaves you feeling toned, centered and confident. I provide small equipment for your use during class, such as fitness circles, small balls, foam rollers, weights, flex bands, wobble cushions. But you need your own mat! Mats vary in price from €6 to €60 plus. Generally, you get what you pay for. Pilates mats are thicker than yoga mats to provide more cushioning for the spine and knees. For more about mats and where to get them, see here. Like anything, you get out what you put in. In other words, the more you practise, the quicker the results. The average person doing 2-3 workouts per week would see significant results within 3 to 4 weeks. However, this depends on the individual and other factors such as existing level of fitness, how quickly concepts are grasped, and how committed you are to continuing. Having said that, even doing one session a week will make you feel better, and perhaps give you a taste for doing more regular workouts. I recommend doing a little often. Set yourself a goal to do a mini-workout even once or twice a week at home between classes; even just doing a few of the moves will reap benefits. Don’t be hard on yourself if you don’t manage it as planned! Give yourself praise for whatever you do do! The best change happens gradually. What can I expect from attending weekly classes over a 6- or 8-week period? If you are new to Pilates, most of your attention will go on learning the principles and mastering the essential level exercises. There is a lot to learn in the first couple of classes and you have to be patient with yourself. While most people attending my weekly classes report some benefits after a matter of weeks, e.g. less backache, sleeping better and increased body awareness, it is not a quick-fix solution and it takes a good few weeks to build up your knowledge and practice of Pilates. I offer 6-week or 8-week blocks of classes on a rolling basis, and strongly recommend continuing as part of your commitment to your own health. Once you have completed a course, you will be familiar with the essential level exercises. Once you have mastered the essential level and are no longer challenged enough, you can progress to intermediate level exercises. How long it takes for your body to master the essential level exercises depends on your base fitness levels and how much time you give it. There is some truth in what Joseph Pilates said: “In 10 sessions, you will feel the difference; in 20 sessions you will see the difference and in 30 sessions you will have a whole new body.” But bear in mind he was referring to someone who does minimum of three sessions per week. You’ll definitely feel different after 10 sessions, but a ‘whole new body’ would need dietary changes too! The more you do, the more you change. Do I have to pay for all weeks in a block of classes even if I know I’ll miss one class? I’m afraid so; I have to pay rent for the venue even if you are away. However, you may be able to come along to a different class at another venue during that week – check with me if possible. As long as you are over the first trimester and have medical clearance, pilates is safe to do during pregnancy under the guidance of a trained professional. STOTT PILATES follows the current standards in the fitness industry regarding safety during pregnancy and the guidelines set out by the American College of Obstetricians and Gynaecologists and the Society of Obstetricians and Gynaecologists of Canada. During a normal, healthy pregnancy, moderate exercise is recommended. Pilates movements can strengthen the pelvic floor and abdominal muscles, prevent varicose veins, low back pain, maintain fitness levels and prepare the body for the physical demands of motherhood. A woman’s body goes through many changes during pregnancy and the moves must be adapted and modified as the pregnancy progresses. Excessive stretching must be avoided. I only teach ante-natal classes by arrangement in home studio. Is Pilates helpful in regaining body shape after a baby? Yes, Pilates is particularly good for strengthening the pelvic floor and toning the abdominal muscles that are stretched during pregnancy. How soon you can start depends on the kind of birth you had. Pilates is not recommended until 6 weeks after the birth, and longer if you have had a Caesarian or any other complication. Re-training the pelvic and tummy area should be done from the inside out – emphasis is on strengthening deep abdominal muscles. One-on-ones or semi-private classes are ideal for new mothers. Talk to me if you would like to organise classes with a few friends – it’s surprisingly affordable, doable and enjoyable!! As long as you don’t have an acute back injury, a Pilates workout is safe for ‘bad backs’. The workout is gentle and controlled with no sudden jarring actions, and I would modify the exercises to accommodate your limitations, continually challenge you within your range, and monitor your improvements. Regular Pilates classes are, in fact, frequently recommended by physiotherapists to assist with building the strength of core abdominal muscles that protect the back and help prevent injury. If you commit yourself to a consistent workout schedule, you will certainly feel results. Can I lose weight by doing Pilates? Pilates is not a weight-loss programme, although it can be a positive addition to an overall weight loss plan. Weight loss occurs when the number of calories consumed is less than the number of calories expended. The most successful and healthy way to achieve weight loss is an exercise plan that includes an aerobic component coupled with a strength training component, such as Pilates exercise, and following a balanced diet. Much of Pilates exercise requires you to look within, focus on your breathing, and feel the subtle differences within your body. By strengthening the postural muscles, people have learned to maintain good posture thereby appearing taller. It was devised by Joseph Pilates (1880-1967) as a mind-body exercise system to strengthen the weak and challenge the strong. Joe Pilates was a German expatriate in England who first made his mark during World War 1, when he developed a series of exercises to help prisoners of war interned in Jersey to regain strength and mobility. He made equipment from springs and frames, commonly found in the dormitories of the POW camps to start the rehabilitation process. The help given by springs and handles, working with or against gravity, allowed patients who would otherwise be incapable of performing the required movement patterns, to gain the strength and control needed over time. Only once this strength and control was gained did he work with patients on the mats. When Joseph Pilates moved to New York in 1926, the local professional dance community discovered that his conditioning techniques helped prevent injury and improve strength, while maintaining long, even muscle tone. This sparked a vast following of the method of exercise. Initially, he called it ‘Controlology’ but that name didn’t stick and his own surname was used. In Pilates, the focus is on breathing deeply, in through the nose and out through softly pursed lips. Emphasis is put on breathing into the backs and sides of the lungs – in normal life, we tend to breathe only into the top part of our lungs. Deep exhalation – emptying the lungs fully – is followed by deep inhalation. This focus on deep breathing encourages relaxation of the shoulders and good oxygenation of the blood. We gently contract the pelvic floor muscles on the out breath, which in turn helps in engaging the deep support muscles of the lumbo-pelvic region (the transversus abdominus). You will hear a lot about the placement of your pelvis during your Pilates class! When your pelvis is in ‘neutral’, the natural lordotic curve of your spine is present. Your pelvis will be in neutral during movements where your feet are both in contact with the mat. The ‘imprinted position’ is a slight posterior tilt of the pelvis – where you contract the oblique muscles between your hips and ribs to slightly flatten your back into the mat. The imprinted position gives you stability and protects your lower back when you are doing movements with your legs off the mat. The abdominal wall attaches to the lower ribs. During the Pilates class, you will be reminded to try and keep your rib cage flat against the abdominal wall, i.e., ribs not lifting up, for example, when you raise your arms overhead. This principle is really important in the context of the computer age we live in. The scapulae (shoulder blades) are held in place by a complex series of muscles with only one bony attachment (to the clavicle). It is really important to balance these surrounding muscles and to control the movement of the scapulae. Stabilising the scapulae is vital before your start every movement. The cervical spine (top of the spine) should hold its natural curve and the skull should be balanced directly above the shoulders in sitting or standing. The cervical spine should follow the line of the thoracic spine in neutral – this is particularly important when you are raising your shoulders and upper body off the mat. To this end, you must nod your head slightly (bring your chin gently towards your chest) before flexing the upper torso off the mat. This stabilizes the cervical area and avoids neck strain.